The Song Remains The Same was the first Led Zeppelin live album issued from 1973 concerts at the Madison Square Garden, New York which promoted the House Of The Holy studio album. It was released in 1976 as the soundtrack to the concert film of the same name. Led Zeppelin are known for their great live performances and they’ve become one of the most heavily bootlegged artists in the world. It was re-issued in 2007 with a much better sound and with extra songs included. This makes it much more comparable with the other big Zeppelin live album, How The West Was Won. The 2007 remastered version added six extra songs (Over the Hills and Far Away, Misty Mountain Hop, Since I’ve Been Loving You, The Ocean and Heartbreaker) which has helped to improve the balance of the live album. Five tracks from Houses Of The Holy, four from Led Zeppelin IV and representatives from the earlier albums. As far as I’m concerned, Houses of The Holy is one of their weakest studio albums. The bonus tracks certainly help to improve the set list but I think they could have done better in 1973 and I’d certainly like to see a live album from 1975 or 76 to showcase the Physical Graffiti songs. I remember being very disappointed when this album came out in 1976. My friends at school loved it but I thought it was bloated. 29 minutes for Dazed and Confused because Jimmy Page is whipping his guitar with a violin bow… you’ve got to be kidding. I never play it. A drum solo that sounds as if it goes on for even longer – it’s actually ONLY 12 minutes. I haven’t even bothered putting this on to my iPod. I hate long drum solos. The latest recording sounds much livelier than the original and you get much more of a feel for what it was like to be at a Zeppelin concert. Originally, How The West was Won was much the better album but now that we have this remastered version, it’s harder to make the choice. Here are some videos of Led Zeppelin live in concert in 1973. Again the remastered version is an improvement because it better represents the original 1973 concerts at the Madison Square Garden. I’m not rushing to judgement on this updated album. I’ve always loved live albums and I regarded the original version of The Song Remains The same as a huge wasted opportunity. It’s hard to shake that assessment from my mind, even though I know this is a much improved version. I also have the nagging theme in my mind that I prefer the 1971 concert captured in the BBC Sessions album. Critical reaction when the album first came out was very negative. Critics agreed that Led Zeppelin were a great live band but the feeling was that The Song Remains The Same didn’t do them justice. The 2007 reissue has been more positively reviewed but it’s still not seen as the critical Zeppelin album. In the best live albums ever lists, How The West Was Won receives more recommendations but these ranked The Song Remains The Same. Over at Amazon, there are more five star reviews than anything else but there are people who feel that the first Led Zeppelin live album could and should have been much better. What Do You Think About The Song Remains The Same? 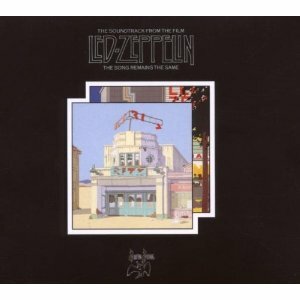 What do you think about this live album by Led Zeppelin? Is it better or worse than How The West Was Won? If you don’t see your favourite hard and heavy rock albums in that poll, they may be in the second division poll. Led Zeppelin are also seen as a pioneer of blues rock. You can also see the results of how other readers have voted in these live album polls. This entry was posted in 1970s Live Albums, Blues Rock Live Albums, Heavy Metal Live Albums and tagged 1970s Blues Rock, 1970s hard rock, 1973 live albums, blues rock 1973, heavy metal 1973, Led Zeppelin Live Albums by Paul Simister. Bookmark the permalink. Not as good as How The West Was Won. Zeppelin really cook on that album. I agree with you that a Zeppelin live album with Kashmir, In My Time Of Dying etc would be great.